Originally the Sears Tower, this 110-storey structure touches c.1,300 feet. 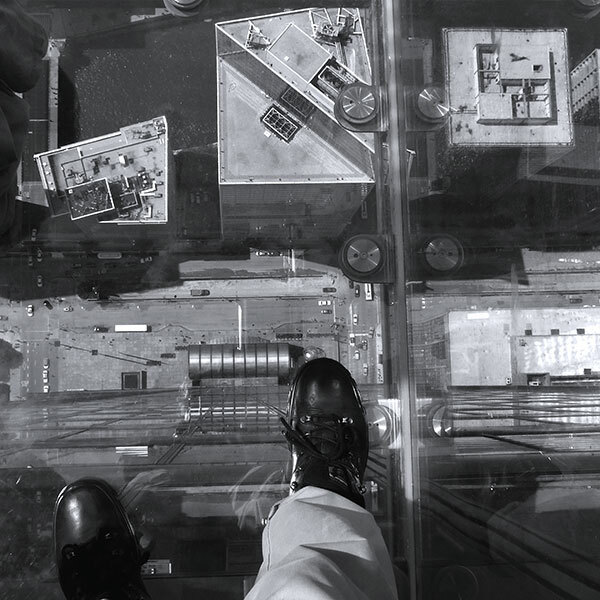 The Skydeck viewing platform is on the 103rd floor and one of its delights is The Ledge, projecting glass boxes offering a foot-tingling experience of suspension above a very remote sidewalk. Hiking boots are as appropriate to city walking as out in the wilds, perhaps more so standing on this narrow ledge above the South Wacker Drive canyon below. Black and white tones worked better than the original rather lightweight noonday colour. 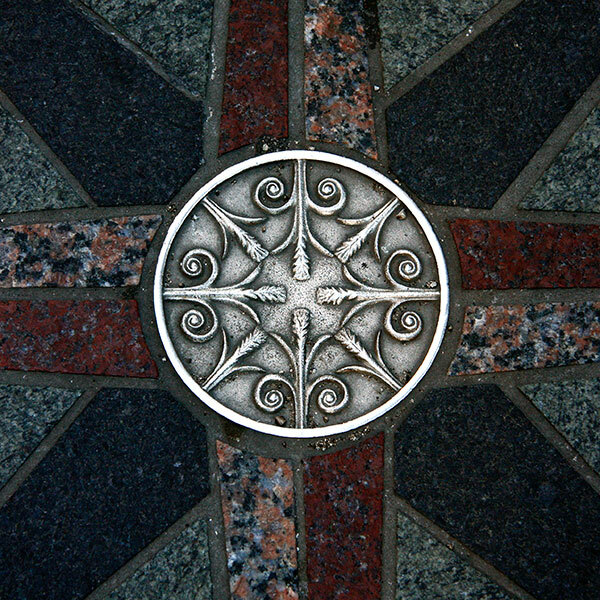 The remaining images are on firm ground and record small sidewalk details encountered on USA city walks. Apart from their purpose I was as usual interested in the design elements of line, shape, pattern, geometry, colour, etc., especially where a painterly quality emerged. 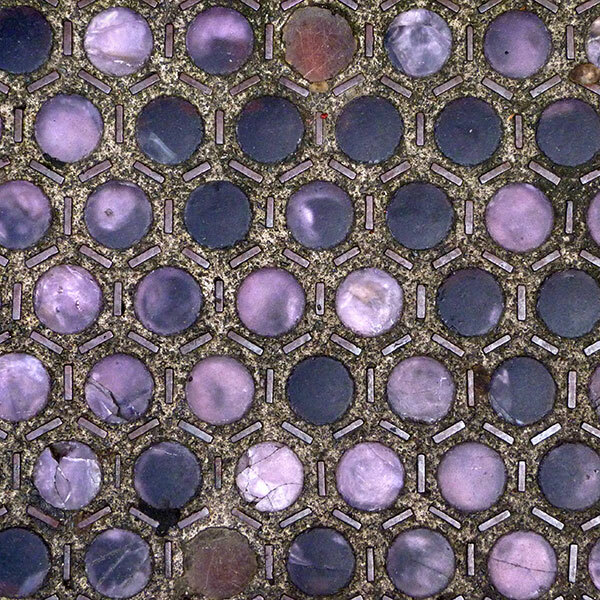 These violet coloured glass studs were inset into screed on a metal honeycomb on the sidewalk, purpose open to conjecture. 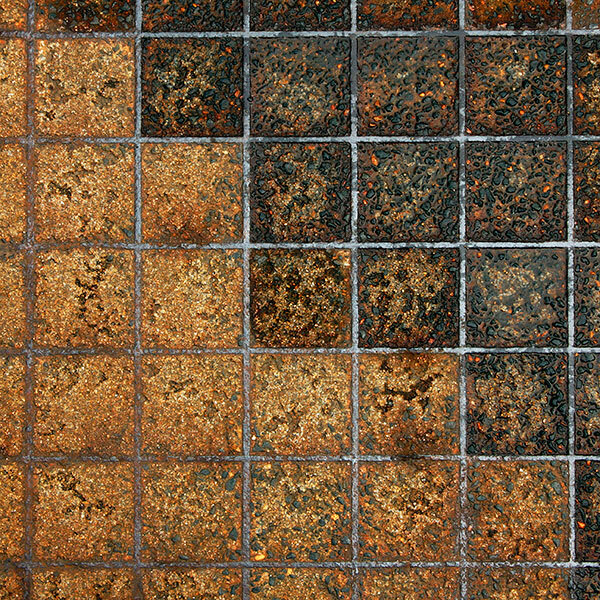 This is a detail from a sheet of perforated iron or steel sheet set into a poured concrete sidewalk, function unknown. I photographed Images 2, 3 and 5 on one of my visits to the Elliott Bay Book Company store when it was located at 1st Avenue and South Main before relocating to Capitol Hill. Its bold brick interior spaces under heavy and intricate timber roof structures housed an incredible range of books on hand-made wooden shelves. Such individualism in design is echoed in a more formal and refined form in its current premises at 1521 10th Avenue: visit and buy a book. These daylight patterns on the sidewalk were created by a sculpture in glass and stainless steel at the entrance to the SBRI building in Seattle. 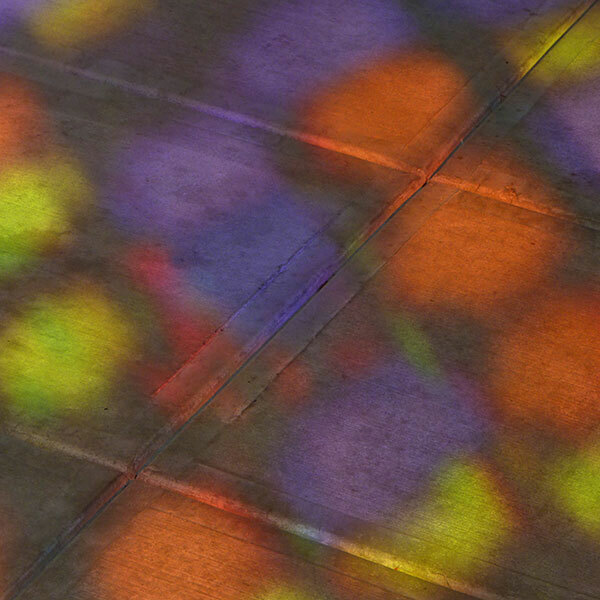 An artist’s quote on the information plaque reads: "The two sections are made of light and colour, with a rhythm that recalls stained glass windows. They glow in the morning light and wash colour onto people as they enter the building. At night they shimmer and project their colors outwards." The underlying theme derives from SBRI studies of the genetic sequence of a parasite that causes the leishmaniasis disease quoted as affecting 12 million people every year. This hinged metal panel set into a sidewalk may have covered access to the cellar of the adjacent building, perhaps for fuel deliveries. 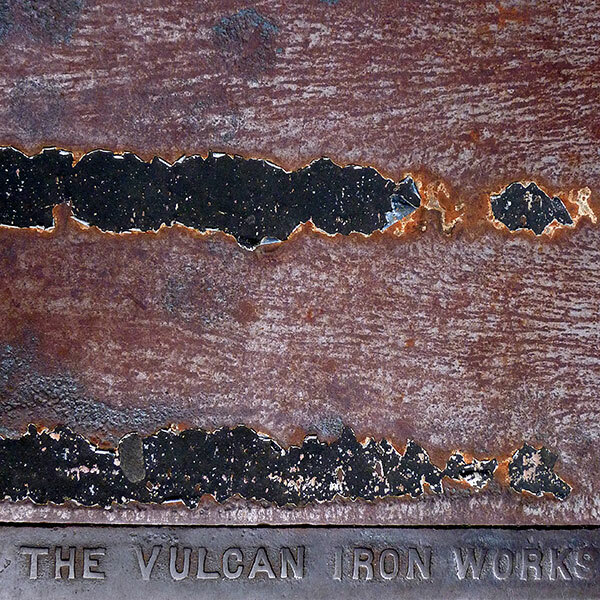 Its location is quite close to the site of The Vulcan Iron Works once set on South Lane Street and active from the late nineteenth century into the twentieth. There must be more survivors from their products manufactured when Seattle was rapidly expanding just a few decades after its first non-native settlers arrived around 1850. It was pure chance that put a labelled example of one of them under my feet. 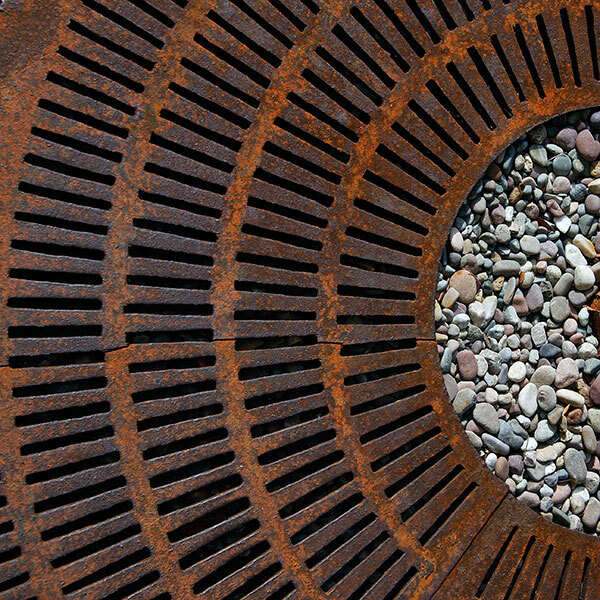 Perforated cast iron grates ventilating tree roots are a common sight in the built environment. Designs might be as simple as this one or more creatively complex like those in the following couple of images. 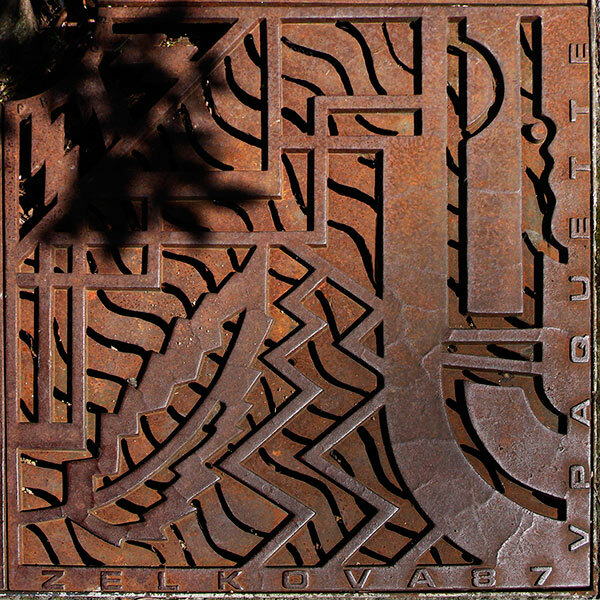 This square format with circular motifs design seems fresh from the foundry with its rough surface and the dark and light red rust on radii and rings in the casting. It’s yet to be trodden into a smoothly polished patina by passing feet. 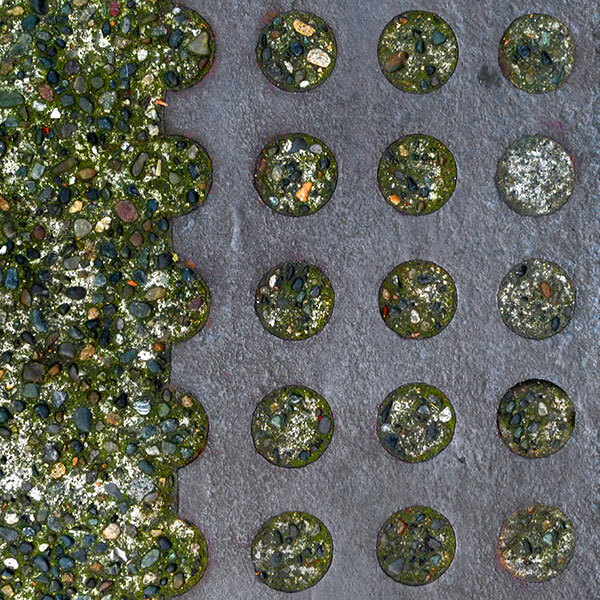 The fresh and clean river gravel in the centre circle provides a fine contrast in form and texture. 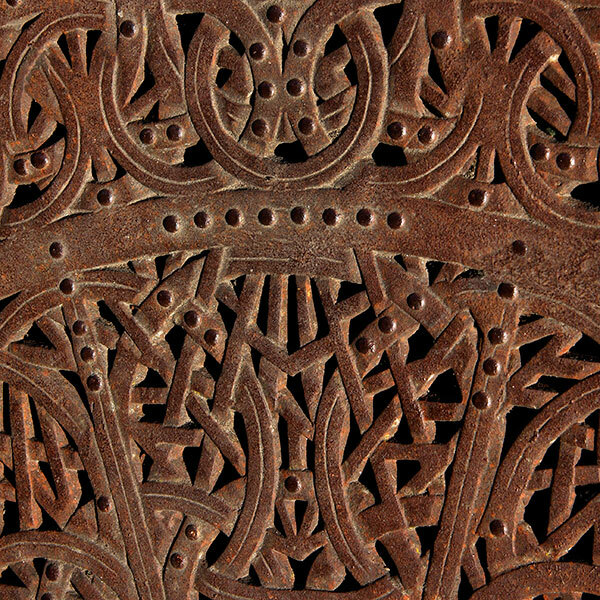 This design is more intricate but offered nothing to identify date or origin. The nineteenth century architecture of Tacoma appeals and it’s good to see that much is being restored, with former industrial buildings acquiring new functions. Images of a few of them are in the TACOMA ARCHITECTURE gallery. There are still traces of the once extensive railroad presence in the City but now separated from the operational waterfront tracks linking Seattle with San Francisco. Four panels complete this sidewalk tree grate around a Japanese Zelkova Elm growing in a Pine Street sidewalk. In a 2005 City Government survey of street furniture and art a V. Paquette is listed as one of several designers involved in creating a range of forms. Cast iron and steel objects are common features in the built environment and Seattle offers its own wide and creative variety. The bridge’s cellular steel and concrete sidewalk was rust-stained and weathered. I liked the formal yet chance division into light and dark areas on the grid. The first few hours after dawn offered almost deserted streets in which to work in subtle light to make images such as this enrichment of colour created by overnight rain. A revised version appears as Image14 in the gallery ABSTRACTION 4. 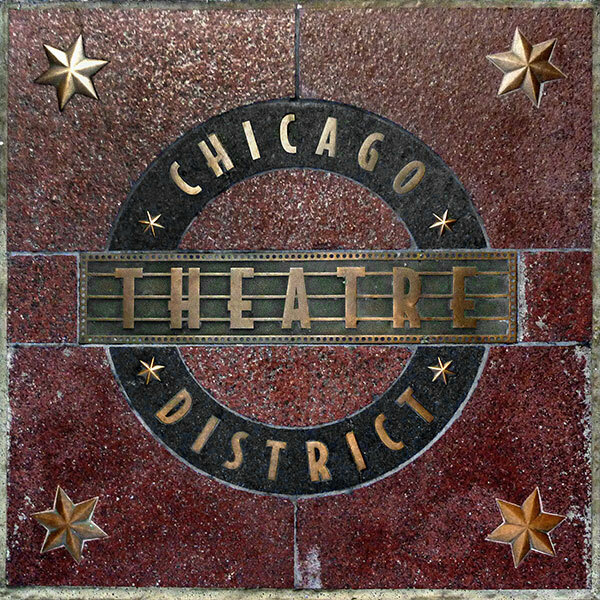 This is one of several plaques to this design set into Theatre District sidewalks in the Chicago Loop. It survives, polished but intact, when others have been have been damaged by the wear and tear of walking feet. It echoes something of the glitzy glamour of the area’s show-business buildings. 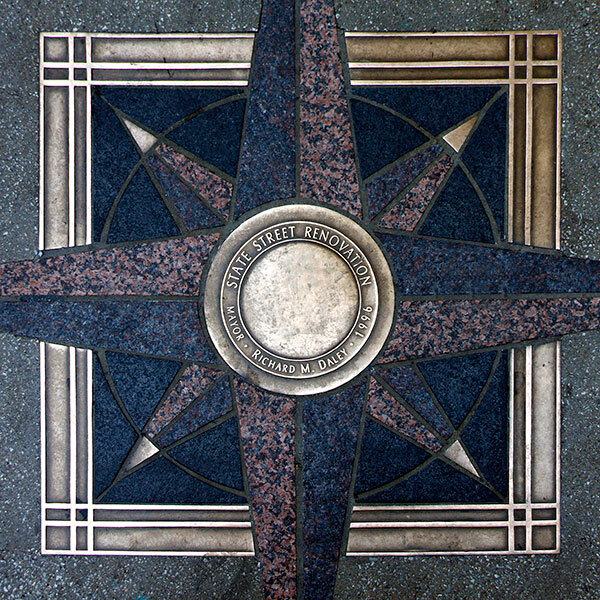 This is the central detail from a metal compass star set into stone on the La Salle Street sidewalk perhaps also commemorating the 1996 renovation of State Street. It also directs walkers to Lake Michigan along Madison Street. Even allied to my tall stature the lens lacked the width needed to record the whole panel. I’d walked along this busy highway a number of times to visit Half Price Books in downtown Redmond east of Seattle. Bookstores are a perennial attraction anywhere and this one added a number of books to my collection. Such pleasures were tinged with regrets when others were thought too heavy for travel baggage. 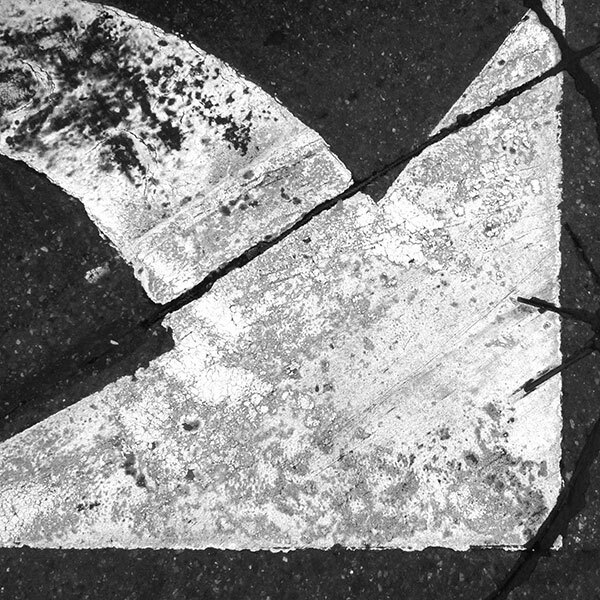 Waiting to cross, I’d looked more than once at this stained and tyre-worn white arrow on speckled black asphalt. A record seemed appropriate so I played traffic chicken safely between light changes to capture an image of this ubiquitous graphic. Here, a white parking bay line cuts across a yellow kerbside band in front of the buildings at the Fishermen’s Terminal in north Seattle. 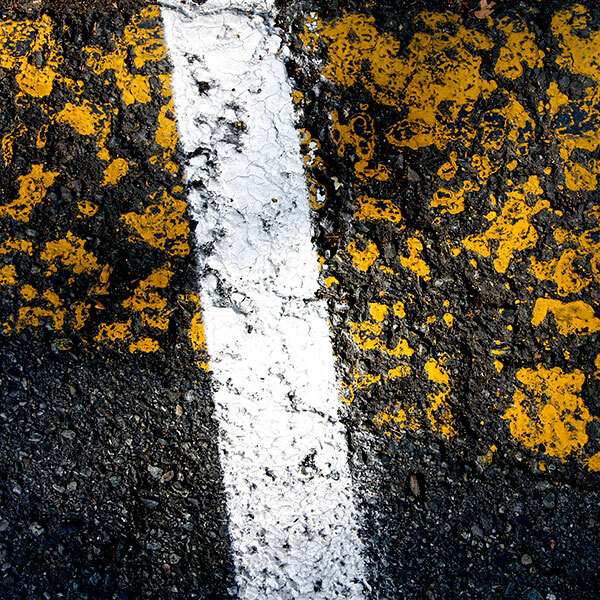 The breaking asphalt, worn colour textures and the composition appealed as a formal and painterly image. 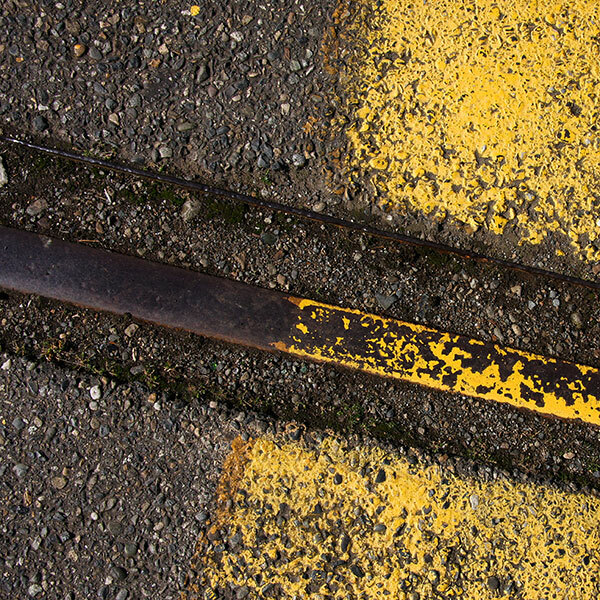 Steel rails can still be found on the track bed of the former Northern Pacific Prairie Line route on Hood Street from the east to the Tacoma waterfront. Warehouses were built alongside, and many have been restored and converted to contain new functions. The University of Washington Tacoma occupies some of them and its campus embraces a stretch of the tracks now developed as a linear park, the Prairie Line Trail. This image was made from a then unworked stretch of track set into the concrete road surface but more for its elements of composition than its history. Sacramento is home to the California State Railroad Museum containing a fine collection of locomotives, rolling stock and memorabilia. Its contemporary brick architecture is set on the edge of Old Sacramento State National Park where streets of original and reconstructed buildings reflect the nineteenth century. A replica of the original Central Pacific Railroad passenger terminal is set close by on the banks of the Sacramento River. Steam trains operate along its banks. 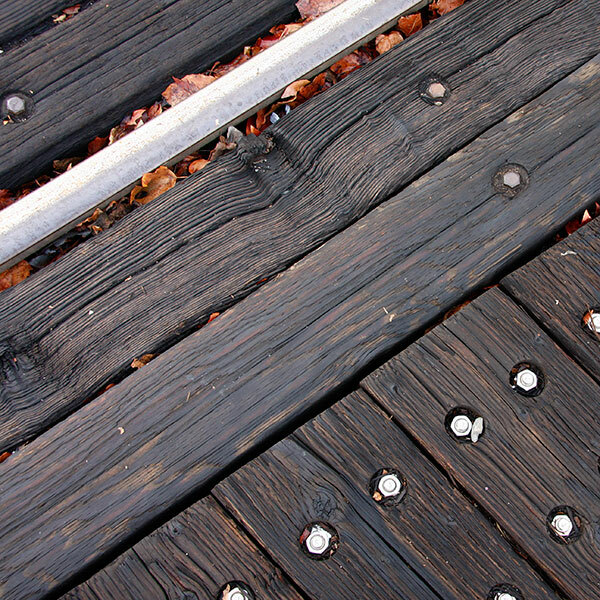 This detail of timber and steel is from a level crossing linking Old Sacramento to the riverside promenade across the rails. The first short streetcar railroad in the city opened in 1889 and route mileage operating cable and electric cars eventually reached over 200 miles. The Seattle Municipal Railroad closed the last line in 1941 in favour of buses. This image is a detail from a stretch of track enclosed by hard red brick paving. It lies beside South Lander Street near its junction with Occidental Avenue set south of King Street Station. 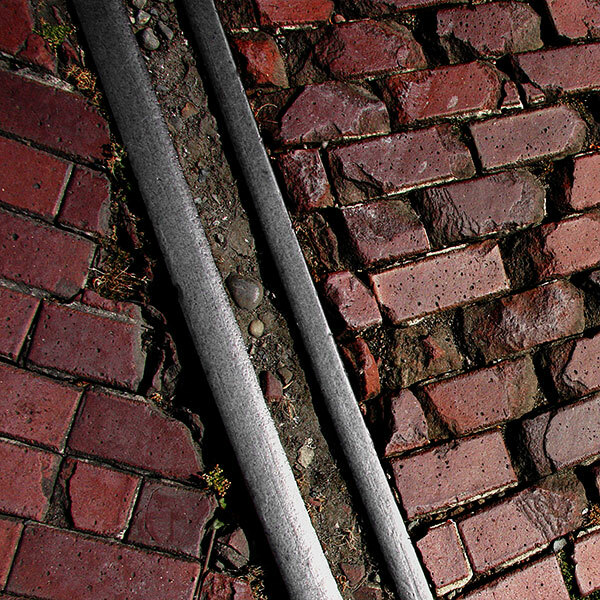 The enclosing red brick road surface has been described as a characteristic of the system. The SEATTLE RAILROAD TRAINS gallery contains other imagery shot nearby. 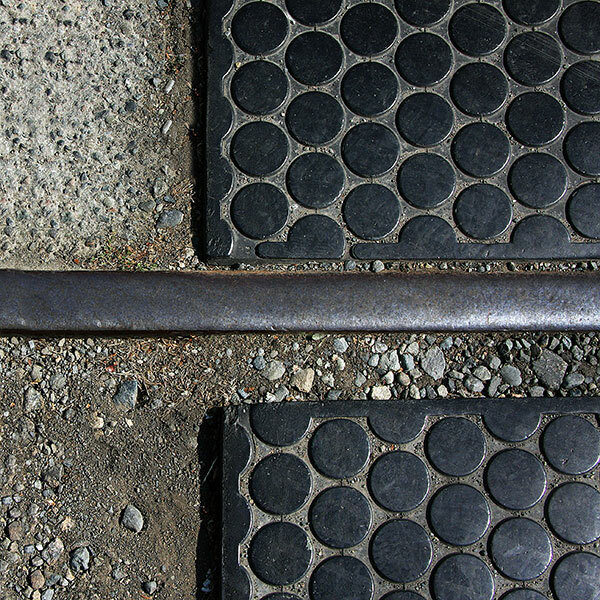 This is a fragment of the Occidental Avenue track as it crosses a wide South Lander Street where the rails and their raised disc steel plate infills lie polished by vehicle tyres. From both ends the tracks appear on hard and dirt edgings to the roadway, easiest to follow north as far as the Safeco Field. Street railroads returned to the City in 2007 with the opening of the South Lake Union Streetcar route and the 2014 completion of the First Hill Streetcar as part of a longer term system development. In both images I was more concerned with pattern etc. rather than the recording of a fragment of railroad history: perhaps next time?